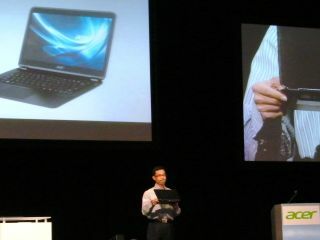 Acer took to the stage at CES 2012 to announce a number of new laptops, including the ultra thin Acer Aspire S5, and also to give the world a very brief glimpse of its upcoming Acer Iconia Tab A700. No sooner was it revealed, it was whisked away again but we managed to get some stats on the device and it sounds like one powerful tablet. The new Acer Iconia tab will come packing a quad-core CPU – no details were given on who is behind the chip – and have one of the highest resolutions for a 10-1-inch screen. Because it has so much power behind it, the Acer Iconia Tab A700 is set to have a screen packing 1,280x800 pixels, which means you will be able to watch 1080p footage as it was meant to be seen. It also means it specs match that of the Eee Pad Transformer Prime. Other than this, all we know is that the tablet will come with Android 4.0, so you won't have to wait for an Ice Cream Sandwich upgrade as it will come with this OS in the box. As Acer didn't give out that many details, we reckon the full unveiling of the new Acer tablet will be at Mobile World Congress 2012. As for an new Acer Iconia tab A700 UK release date, no details were given – and we have nothing on the price either. You won't have to wait long for our hands on: Acer Iconia tab review, though, as we managed to get some face time with the device. So stay tuned for this and other CES 2012 news.